It has been about 17 years since I purchased a new washer, but my old gal started giving trouble recently. Hubby managed to “fix it” using parts from another washer, which got me through another few months, but unfortunately the motor caught fire and out it went. Buying new things - especially appliances - is very difficult for those of us with Chemical Sensitivities. Reactions to the off-gassing of new plastics, lubricants, rubber and the like can cause all sorts of reactions. I didn’t really want to spend a lot of money on a washer as this winter was rather difficult with several things hitting the pocket book. However, I was a little torn as I would rather have something last a long time and not just send another appliance to the landfill in a few years. Gone are the days of good 'ol appliances that did the job and lasted a lifetime. Now appliances are all full of high tech crap that is not built to last. I even saw a washer that required a cell phone app to operate . . . come on really? I did some research and I decided I would go for a GE washer with a stainless steel tub from a local furniture store that retailed for about $699. When I got it home and started it up, the noxious smell of plastic quickly radiated throughout the entire house. I opened all the windows and doors - in frigid January weather - turned on all the fans and the air cleaner. Even after 8 – 10 rinses the smell would not go away. It began to give me brain fog and headaches along with the typical sinus burn. So hubby returned it. The other thing I hated about the GE washer was that no matter what the setting, it would never fill up with water. It barely spit enough water in to dampen the clothes. Having a washer that uses sufficient water to clean clothes is especially necessary for those of us with MCS as we do not use chemical cleaners and detergents. Additionally, the lid locked down as soon as the washer started and there was no way to re-open the lid to add another item without unplugging the machine. And when you did unplug the washer the entire tub of water would automatically drain (purge) when it was plugged back in. This does not help if you want to soak your clothes overnight as once the water is purged – after plugging in the washer – it will completely refill and a whole tub of water is wasted. This purge feature can be found on many new washers. In addition to draining when unplugged, if the lid is left open for more than 20 minutes the purge will automatically drain all the water out of the tub. I just want to fill my washer, be able to pop in an extra item if needed, let soak overnight and then start from where I left off. Is that too much to ask for? I decided to do more research and found two possible contenders for a washer that would fit my needs - Speed Queen and Maytag Commercial. I opted for the Maytag Commercial because it was available locally through Costco and Costco offers a 90 day return policy on appliances. I was afraid that if I ordered the Speed Queen online and was not able to off-gas it - or didn't like it - I would not be able to return it. Not to mention, the Speed Queen would have cost quite a bit more with shipping. tax in and with free shipping. 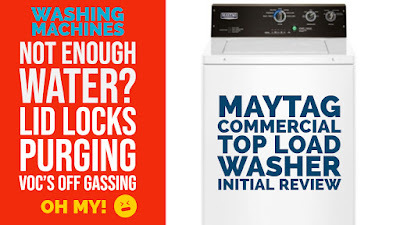 The Maytag Commercial is boxy, basic and rugged . . . just the way I like it. As long as it works. I prepared for this washer’s off-gassing by waiting for a warmer day and blocking off the foyer from the rest of the house, while keeping the outside door open to allow for airflow . I also used the old hoses from my previous washer as I find it difficult to deal with new rubber. I did a full wash in cold with vinegar and then a full wash in hot with vinegar - this is when I started to get the plastic smell with an odd herbal scent reminiscent of caraway or fennel. It wasn't that unpleasant and not nearly as bad as the noxious smell from the original GE. I filled up the barrel again, but this time with warm water and a few cups of baking soda and let it soak - yes soak! Soak without a purge - yup! So it did take a weekend and several loads of laundry before I could do laundry with the outside door closed, but at most it just bothered my sinuses. On day three I spent the entire day doing more laundry with no increasing ill effects. The Maytag Commercial is relatively simple to operate with its three regular settings and three deep water settings. In the deep water setting water will fill right to the top no matter what size load . . . even the regular settings offer plenty of water to cover your clothes every time. You can also open the lid whenever you like. During the fill you can open the lid and the washer will automatically pause. If you need to open the lid during agitation or spinning, just pause the washer by pressing the pause button and the lid unlocks. And if you want to soak your clothes longer than the timed soak settings, just quickly press the pause button and leave the clothes as long as you like. Pressing pause again will start the washer where it left off - without a purge. As the pause button is also the cancel button, be sure press the button quickly as if you hold for it for three seconds it will cancel the wash and purge. The Maytag Commercial (MVWP575GW) is a sturdy machine with a stainless steel drum, has simple basic settings, agitates well, has good capacity, uses plenty of water, has a lid that can open when needed, it can soak clothes without purging and didn't fill the house with VOC's. With a 90 day return policy from Costco, a 3 year Costco warranty and 10 year manufacturer’s warranty - you pay the price for quality at $1603.09. So I am keeping my fingers crossed that it will last me for many many years.